Hello, hello! How are you?! I'm coming at ya today with this amazing acai bowl. It's currently 3 degrees fahrenheit here which is less than idea weather for a chilly treat like this. But you know what, it's totally okay. I have this habit where I shower after I eat acai bowls, drink smoothies, or am just too cold to function during the winter months. So if you're in a situation similar to mine, make this acai bowl and head straight for the shower right afterwards to warm you right back up. Problem solved! So now that we have that covered lets get to the important stuff. 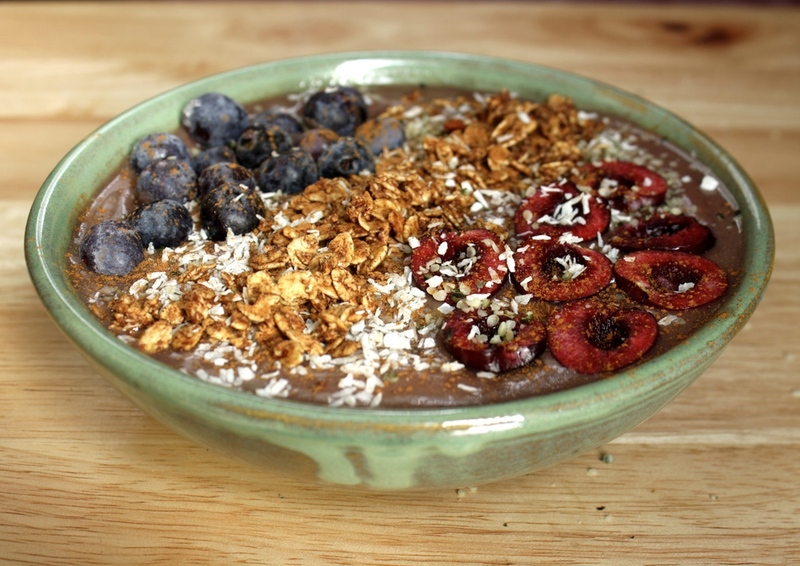 Acai bowls with ginger granola. Oh yeah. Of course I topped it with some fruits and seeds as well to make it really fun. But you can do whatever your little heart desires with this bowl and that's the beauty of it. So many options! So many delicious nutrients! Yes, let's do it. Preheat oven to 350 degrees. In a large bowl throw together all of the ingredients and mix together. Place on a parchment papered baking sheet and bake for about 25 minutes. You'll have lots of extra granola! Store in airtight container for up to 7 days. Blend all ingredients together. Top with granola and other toppings of choice. I used blueberries, cherries, granola, hemp seeds, and shredded coconut. Serve, enjoy!